Many of our clients are starting to think about making the move to online shops, and not only those with products to sell. E-commerce software also offers a very useful tool for managing registration for classes, clubs and events. Once the shop is in place you will have the possibiltiy of taking payments for any number of online transactions from course bookings to merchandise sales depending on your business needs. With our creative input, your shop will be tailor made and designed to fit harmoniously with the overall look of your existing or new website. Our hosted sites are backed up every day and we use state of the art security for online transactions. As our websites are responsive (viewable and usable on all screens) your shop will look good on any device. Hosting and maintenance charges include SSL for e-commerce security. 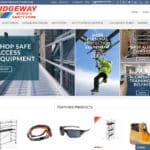 Accessandsafetystore launched in January 2018. 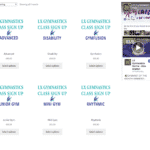 LX Gymnastics Centre class registration online is now open.